How can you fight against climate change? With a simple gesture, giving a second life to your used clothes, you areccollaborating in the fight against global warming. Textile consumption is responsible for between 2% and 10% of the total environmental impact of human activity. Even more: 11% of CO2 emissions attributed to each household in the Western world is due to the manufacturing and distribution of clothing and footwear. Consequently they have an enormous impact on global warming. The textile used to deposit in our containers or donuts in our stores has two destinations. 70% is classified in our plants and the remainder is sold to recycling companies, because we have no ability to classify. 59% of clothing and footwear Ads are prepared for reuse. 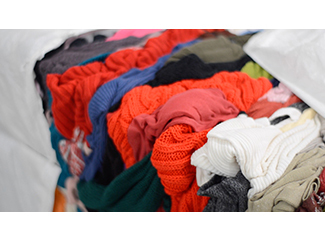 When reusing clothes, do not buy new clothes, which help reduce the consumption of raw materials. 35% consists of material whose quality is not allowed to have a second life, but whose fibers can be used by specialized companies for the manufacture of other products. With this help, also to reduce the consumption of raw materials. 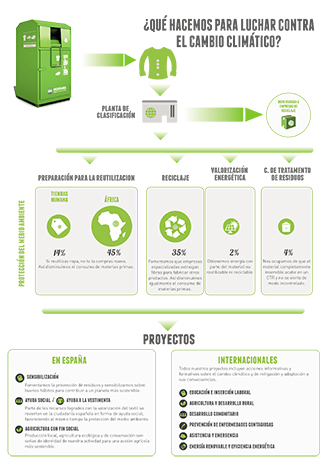 2% is material, a priori, useless because you can not reuse or recycle, but we are capable, with the help of specialized bodies for energy. The remaining 4% is unusable product, which is sent to waste treatment facilities, thus preventing an uncontrolled manner is poured. It seems clear therefore that promoting reuse and recycling textile actively collaborate in the fight against climate change. In addition, resources achieved with this process of recovery, allows to carry out sensitization programs, social welfare and agriculture in Spain, and development cooperation in Africa, Latin America and Asia.